Home 1 Faces of Discovery Can triboelectricity wirelessly power the world? Ramakrishna Podila (left), Apparao Rao, Sai Sunil Mallineni and Yongchang Dong are collaborators on the W-TENG technology. Researchers from Clemson’s Nanomaterials Institute (CNI) are one step closer to wirelessly powering the world using triboelectricity, a green energy source. In March 2017, a group of physicists at CNI invented the ultra-simple triboelectric nanogenerator or U-TENG, a small device made of plastic and tape that generates electricity from motion and vibrations. When the two materials are brought together — through such actions as clapping the hands or tapping feet — they generate voltage that is detected by a wired, external circuit. Electrical energy, by way of the circuit, is then stored in a capacitor or a battery until it’s needed. Nine months later, in a paper published in the journal Advanced Energy Materials, the researchers reported that they had created a wireless TENG, called the W-TENG, which greatly expands the applications of the technology. The W-TENG was engineered under the same premise as the U-TENG using materials that are so opposite in their affinity for electrons that they generate a voltage when brought in contact with each other. In the W-TENG, plastic was swapped for a multipart fiber made of graphene — a single layer of graphite, or pencil lead — and a biodegradable polymer known as polylactic acid (PLA). PLA on its own is great for separating positive and negative charges, but not so great at conducting electricity, which is why the researchers paired it with graphene. Kapton tape, the electron-grabbing material of the U-TENG, was replaced with Teflon, a compound known for coating nonstick cooking pans. “We use Teflon because it has a lot of fluorine groups that are highly electronegative, whereas the graphene-PLA is highly electropositive. That’s a good way to juxtapose and create high voltages,” said Ramakrishna Podila, corresponding author of the study and an assistant professor of physics at Clemson. To obtain graphene, the researchers exposed its parent compound, graphite, to a high frequency sound wave. The sound wave acted as a sort of knife, slicing the “deck of cards” that is graphite into layer after layer of graphene. This process, called sonication, is how CNI is able to scale up production of graphene to meet the research and development demands of the W-TENG and other nanomaterial inventions in development. After assembling the graphene-PLA fiber, the researchers pulled it into a 3-D printer and the W-TENG was born. The end result is a device that generates a maximum of 3,000 volts — enough to power 25 standard electrical outlets or, on a grander scale, smart-tinted windows or a liquid crystal display (LCD) monitor. Because the voltage is so high, the W-TENG generates an electric field around itself that can be sensed wirelessly. Its electrical energy, too, can be stored wirelessly in capacitors and batteries. 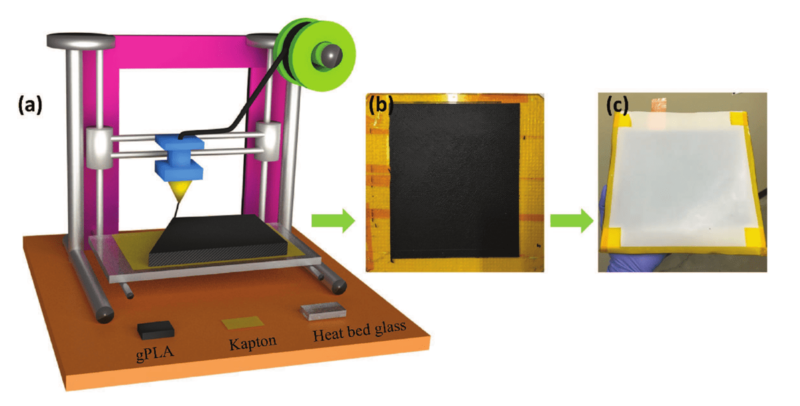 The W-TENG is 3-D printed out of a graphene-PLA nanofiber (A), creating the bottom electrode of the technology (B). A Teflon sheet is then added as the top electrode (C). “It cannot only give you energy, but you can use the electric field also as an actuated remote. For example, you can tap the W-TENG and use its electric field as a ‘button’ to open your garage door, or you could activate a security system — all without a battery, passively and wirelessly,” said Sai Sunil Mallineni, the first author of the study and a Ph.D. student in physics and astronomy. The wireless applications of the W-TENG are abundant, extending into resource-limited settings, such as in outer space, the middle of the ocean or even the battlefield. As such, Podila says there is a definite philanthropic use for the team’s invention. The team of researchers, again led by Mallineni, is in the process of patenting the W-TENG through the Clemson University Research Foundation. 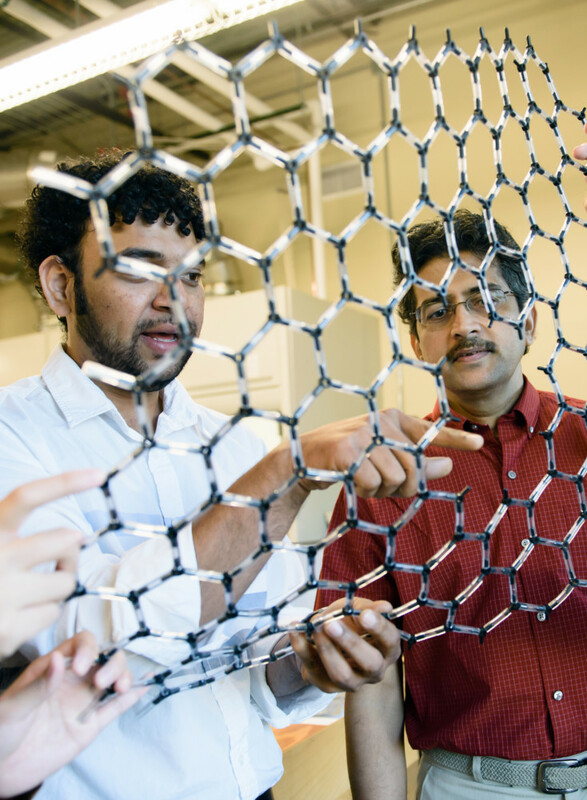 Professor Apparao Rao, director of the Clemson Nanomaterials Institute, is also in talks with industrial partners to begin integrating the W-TENG into energy applications. Podila (left) and Rao study a large-scale model of a sheet of graphene. However, before industrial production, Podila said more research is being done to replace Teflon with a more environmentally friendly, electronegative material. A contender for the redesign is MXene, a two-dimensional inorganic compound that has the conductivity of a transition metal and the water-loving nature of alcohols like propanol. Yongchang Dong, another graduate student at CNI, led the work on demonstrating the MXene-TENG, which was published in a November 2017 article in the journal Nano Energy. Herbert Behlow and Sriparna Bhattacharya from CNI also contributed to these studies. Will the W-TENG make an impact in the realm of alternative, renewable energies? Rao said it will come down to economics. “We can only take it so far as scientists; the economics need to work out in order for the W-TENG to be successful,” Rao said. March 29, 2019 - Volcanoes! Lightning! And Radioactive Gas, Too The New York TimesStudying radon's role in the electrification of plumes above volcanoes could help people anticipate the damage resulting from eruptions, scientists say.